Local business: Wildhaven Soap Co. If you read my post about farmer’s markets, you know how much I love them! In the post, I included information about several local farmer’s markets, including location and time when they are open. A woman that I work with had been recommending for me to try the Beloit Farmer’s Market, as she said it was huge with such a variety of items for sale. Saturdays are a hard day for me to try to go to something regularly, but last weekend, I decided to head out to Beloit after I finished work that morning. I’m so glad I did! My bags were LOADED with produce (and I even found a stand selling 100% grass-fed beef). But one unexpected treasure that I found was a stand selling Wildhaven Soap. 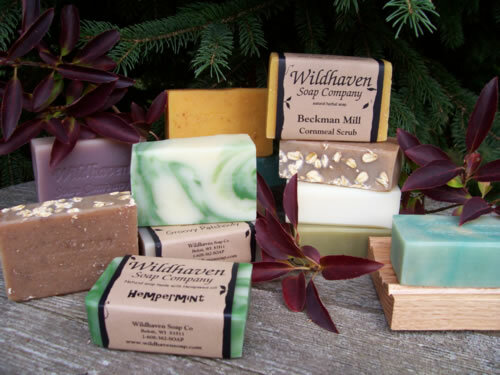 Wildhaven Soap is a local business (Beloit, WI) that is owned by Tina Wagner. She has been making soap for about 15 years, using essential oils and organic and natural ingredients. I bought the “Sea Mist” variety of her bar soap, as I loved the scent of it. The ingredients are: samponified olive, coconut, palm and castor oils, purified water, sea salt, kombu seaweed, kelp, spirulina, and essential oils of sweet orange, juniper, clary sage and lime. I’ve included a link to her website: www.wildhavensoap.com You can find a list of the products she offers on her site, along with ingredients. I would definitely recommend, though, coming to the Beloit Farmer’s Market to see Tina and her booth, as you can also check out all the other goodies the Market offers!